Something Delightful : Current Favorites! There is always that certain piece of jewelry, bag, pair of shoes, etc. that stands out as being your favorite item. These items, for me, are the ones that make me feel so happy when wearing them as they give me the look that matches my personality for the day. Today, I received my first KJP bracelet from the Vicker's Bow Collection. Let me just say, there is SO much you can do with these amazing bow ties for your wrist! My goal is to collect the whole collection. As stated, they are "tailored for the well dressed wrist!" My Burberry Crinkle Scarf and Miriam Haskell Pearl Strand have been have been possibly two of the best additions to my closet. This fabulous gold, oversized bow came to me as the free gift in my package from Modcloth! How precious is this?? It was quickly added to my favorite list. 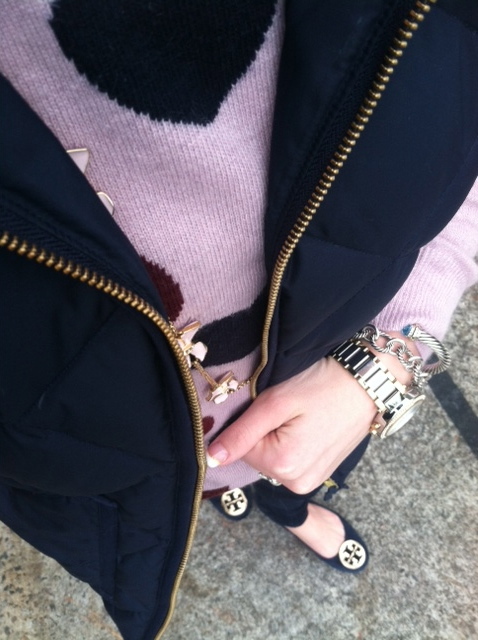 The J.Crew signature puffer vest has been a perfect compliment to wearing my sweaters. I have enjoyed it immensly! Several other colors of this vest are listed on my Christmas list. The Tory Burch Michelle bag caught my eye on the site, stole my heart in the store, and has made it's way onto my favorites list. It is perfect with the gorgeous, metallic, soft leather and being the perfect size! The Burberry Nova Flats have also been a favorite of mine. They add just the right touch to a black outfit. The best part about your inspirational items is the inspiration they will give you when it comes to gift giving, and isn't this the time of year for gift giving! My inspirational pieces have helped me come up with some of the perfect presents. If you haven't already, be sure to enter the Henri Bendel ornament giveaway! It ends tomorrow. You can enter here. Love the hair bow and the Vickers bracelet! love love love the Tory Burch!